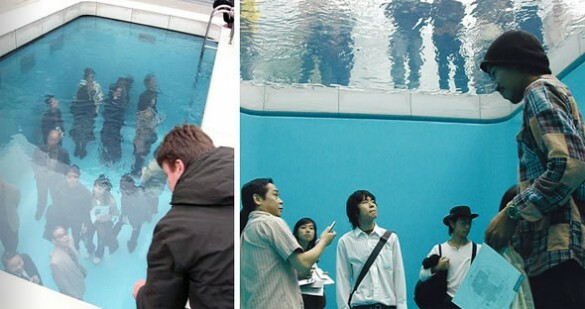 Could you live inside a swimming pool? 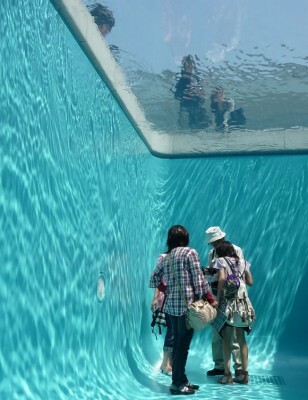 The exhibit, made by Leandro Elrich, in one of the courtyards at the 21st Century Museum of Contemporary Art looks like it is a deep pool filled with water but in truth, the water is only 10 cm deep and atop transparent glass. 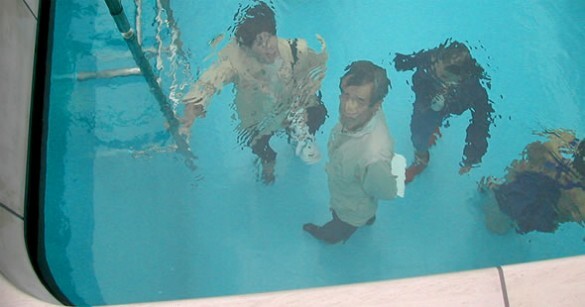 Museum visitors can view the pool from above and from inside the pool. To those above looking down on those below, it would appear that the persons below are inside the water, walking about. To those below, the people above appear through a shimmer of water. Either way, it’s like seeing the world through a fish’s eyes. Live in a fish bowl? Hmmm…not likely. Visit for a spell? Most certainly. Blub Blub. You’re not the average blog author, man. You surely have something important to contribute to the World Wide Web. Such a outstanding blog. I’ll revisit again for more. You completed several good points there. I did a search on the theme and found nearly all folks will agree with your blog. This blog has lots of very useful stuff on it! Thanks for sharing it with me. Me and my husband very much enjoyed this article, we are sitting down right now to a cup of tea and talking with the laptop beside us. Just some questions: When did you get into blogging? How much is hosting per month? How much are you reeling in per month? How many visitors do you usually get? Have you heard any big success stories with people blogging? Appreciated, we’ll be checking back but you can e-mail us aswell. I just found your wondefull webpage and I have to explain how much I appreciate what you have outlined. I hope to return againand find something else I like. It’s rare for me to discover something on the web that’s as entertaining and fascinating as what you’ve got here. Your page is lovely, your graphics are outstanding, and what’s more, you use reference that are relevant to what you’re saying. You are certainly one in a million, great job! I really don’t understand why some people feel the need to be so argumentative. You completed certain fine points there. I did a search on the subject and found nearly all people will go along with with your blog. Thank you for this rather helpful guide . This might possibly be quite useful for these you are just starting section. Very good written article. It will be supportive to anyone who utilizes it, as well as myself. Keep up the good work – for sure i will check out more posts. I dont know how your blog came up, must are a typo, Your blog appearance good. Have a pleasant day. Happy New Year 2011! Thankx so much for this! I havent been this moved by a blog for quite some time! You’ve got it, whatever that means in blogging. Well, You are definitely someone that has something to say that people should hear. Keep up the wonderful job. Keep on inspiring the people! Excellent work there. your blog RSS. Pretty good post. I just came across your site and wanted to say that I have really enjoyed reading your opinions. Any way I’ll be subscribing to your feed and I hope you post again soon.